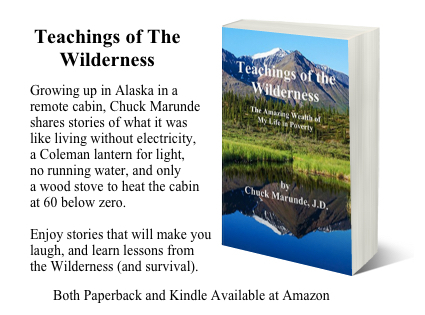 Teachings of the Wilderness is Chuck Marunde’s latest book, a story about growing up in Alaska in a little cabin far from civilization. While this blog is all about real estate, and most of Chuck’s books are about real estate, this book is something completely different and fun. I never imagined that growing up in a cabin in the remote wilderness would prepare me for success anywhere in the world, even in the concrete jungles of the metropolis. I had no idea at the time that I was being prepared to experience life to the fullest. I learned more about how to live a good life growing up in the harsh Alaskan wilderness in abject poverty than I learned in College, in law school, and in the thousands of hours of studying and reading combined. The stories in this book share profound lessons from the wilderness you won’t learn in a classroom. You can get the paperback version or the Kindle version at Amazon at Teachings of the Wilderness. 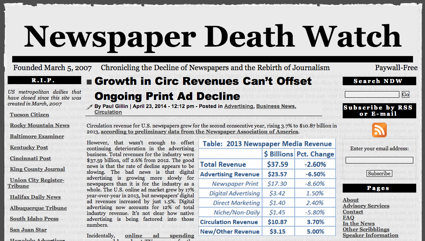 The Death of Newspapers: What’s Going On? We have an oil rig in Port Angeles, and it’s probably the largest rig we’ve ever had in the Port. The Polar Pioneer is an oil rig built in Malaysia on its way to the Chukchi Sea off the northern coast of Alaska. It is over 355 feet high, which means it towers over the entire city of Port Angeles and all its buildings. You can enlarge the photo above by clicking on it, and open this oil rig in Port Angeles to fill your computer screen. It’s worth enlarging, because you can see incredible detail on this rig. You can also see each of the 10 crew members on the little boat alongside the rig. We don’t get many gigantic ships and rigs like this in the Port of Port Angeles, so this is quite a sight. The rig is so tall, it can be seen from many miles away up and down the coast. Notice how the oil rig dwarfs its ship, Blue Marlin. 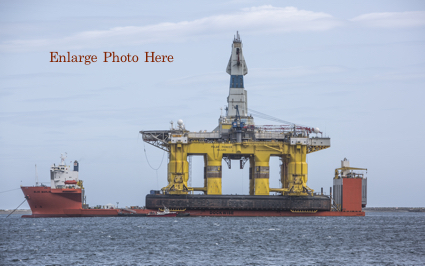 It’s entertaining to see an oil rig in Port Angeles of this size. The Sequim Dungeness River is as high as you’ll ever see it, higher than I’ve seen it in maybe 20 years. People asked if we have floods in the Sequim area, and we really don’t. The Sequim Dungeness is our main river, and when it gets high like this, it wears away some banks and re-routes some minor channels along the river, but even with this much water roaring through the valley, it doesn’t extend beyond the banks of the river, and it doesn’t reach homes. It would be an extraordinary event if it did. 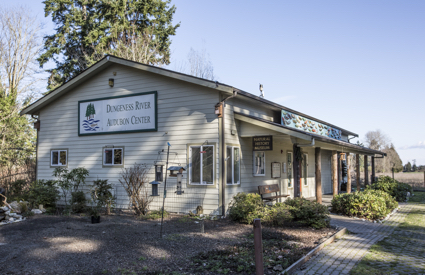 The Sequim Dungeness River is a beautiful river starting way up in the Olympic Mountains as a creek and collecting water as it winds down the mountains heading to its final destination, the Strait of Juan de Fuca. When my boys were young, they often put a raft in the river from the bridge in this video and floated down to the Strait. But the water was much calmer than it is today. The Sequim Dungeness River is not a flooding threat in the county. A bigger threat to homeowners is existing wetlands. We have a high water table and in some areas there are ponds and standing water designated as wetlands by the Army Core of Engineers. I would say this about the Sequim Dungeness River. While we don’t worry about flooding, if you live along the river, you could see your property boundary evolving over the years. One property owner lost 10 feet of his bank one year. Nature must do her thing, and the Sequim Dungeness River is part of our natural beauty. Who likes to make a New Year’s Resolution? No one. When we talk about a New Year’s Resolution, we usually do so with a negative tone, and most people can talk about how they have not kept their New Year’s Resolution from last year (and the year before ad infinitum). So what’s better than a New Year’s Resolution? Something much better. I’ve been doing it for a couple of decades, and it has revolutionized my life. I think you’ll like it. A single New Year’s Resolution is almost guaranteed to be a disappointing failure. “I’m going to lose 20 pounds in six months.” Right. Most of us actually forget about our resolution very quickly, and we don’t like to be reminded of failure. So why go there? Who needs disappointment? Here’s what I do that flips that disappointment from one big failure for the year into many small victories that brings me satisfaction throughout the year again and again. I make the equivalent of many small resolutions all year long, and these are goals I can and do reach. When I reach them I experience a deep sense of fulfillment and the success multiples. Once success leads to another, which leads to more success. The answers you get in life are only as good as the questions you ask. Start asking challenging questions that force you to stretch yourself beyond your comfort zone. You will be amazed at how the conscious, and especially the subconscious, will go to work to find answers to your questions. Your mind will work night and day, even while you are sleeping, to find ways to accomplish what you really want to do, and it all starts with questions you ask yourself. But ask the questions throughout the year, not just for a New Year’s Resolution. My real estate business is constantly improving for the sake of my clients, and it is in those personal resolutions to accomplish much more, to serve my clients better, and to become a better person that really motivates and excites me. My future is very bright, but not because of a single New Year’s Resolution. It is bright because of my New Year’s Resolution multiplied throughout the year. And as you can tell, my resolutions involve serving others better, and that brings a lot more satisfaction in life–serving others. Are we really seeing the death of newspapers? The incredible growth of the Internet has come at great expense to traditional print newspapers. The National Association of Realtors says that 95% of all home buyers start their search for a home on the Internet, not in print newspapers. There was a time when we searched for homes in the classified section of newspapers, but no more. Buyers love the Internet. It’s easy and fast, it’s powerful, and it’s free and anonymous. No wonder buyers love the Internet. 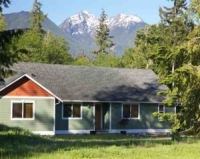 This is the largest real estate blog in the entire Sequim and Port Angeles area, and perhaps on the entire Olympic Peninsula with over 1,500 articles written for buyers. What single article on this blog do you think got more comments than any other article in the last eight years? It is an article I wrote on October 30, 2008 on this blog. It received 41 great comments from readers around the country. Their comments are worth reading, even if you don’t read the article. That article is about the death of newspapers and the rise of the Internet. You can read it at: Print Newspapers Dying. It’s sad that so many print newspapers have gone out of business, filed bankruptcy, or merged with other companies, but consumers are driving the news business with their dollars. Their eyes have turned to the Internet. If you haven’t read some of the fascinating articles about the dying print newspaper business, I recommend a site called Newspaper Death Watch. It chronicles the death of print newspapers in America. All of this is no surprise to home buyers, because you are using the Internet to search for your next home. And you’re reading this news on the Internet. Who is iRealty Virtual Brokers? Social media is another way to learn about Sequim and Sequim real estate. Social media is growing and constantly morphing into newer and better ways to communicate, and social media is alive and well in Sequim. That includes Facebook, Twitter, Google+, Linkedin, and so on. Facebook and Twitter are the main social media sites used in the Sequim area. There are literally hundreds of social media sites, but who can keep up? Some are esoteric and some are very unique, like Pinterest and Instagram. Kids flock to some of these new sites, but for many retirees who live in Sequim and Port Angeles, Facebook and Twitter are pushing the technological boundaries. Linkedin has become fairly popular among professionals in business, but to learn more about Sequim and listen in on the conversations of Sequim residents, you’ll want to use Facebook and maybe Twitter. Twitter has become a popular way to communicate in 140 characters or less, and like many other social media sites, there is a Twitter app for smartphones and tablets. Chatting apps and texting are also quick and simple ways to communicate with a smartphone. Many in Sequim use Facebook to post photographs and to share news and events as well as sharing personal notes of interest. You can follow me on social media sites Facebook or Twitter for Sequim news. Many feel that Sequim is the best place to retire in the U.S. Here are some of the reasons so many retirees from all around the country believe that Sequim is the best place to retire in America. Number 1. Sequim has one of the most agreeable climates and weather patterns of any American city. Exhibit number 1 is the Sequim Blue Hole, aka the Sequim Rain Shadow. Read the full description of the Sequim Blue Hole. Number 2. Sequim has a very low crime rate. Exhibit number 2 are the tiny police blotters. On June 21, 2012, the entire Sequim Police Blotter consisted of these 4 minor entries (compare this to any other city in the U.S.): 1:57 p.m. — Malicious mischief, in the area of Carlsborg Road and the Olympic Discovery Trail, 2:16 p.m. — Burglary, 9000 block of Old Olympic Highway, 7:31 p.m. — Vehicle prowl, 100 block of Hurricane Ridge Drive, 8:27 p.m. — Trespass, 600 block of Turnstone Lane. Low crime is a major reason many of us feel that Sequim is the best place to retire. Number 3. Sequim does not have a history of forest fires. We have never suffered the horrendous losses of residents in Colorado or Arizona or California. See how Forest Fires Hurt or Help Sequim Home Sales. Number 4. Sequim does not have a history of tornadoes, or hurricanes, or flooding. Tornadoes across the mid-west, hurricanes in the southeast, and flooding in several states have destroyed thousands of homes, caused many deaths, and disrupted lives forever. Sequim is insulated from these terrible disasters, and this alone would make Sequim the best place to retire. Number 5. Sequim has no poisonous snakes. If you’ve lived in the desserts of California, Arizona, or Nevada, you know how dangerous a rattle snake can be on a camping trip. The “wilds of Sequim” are free from the threat of poisonous creatures. Number 6. Sequim has a low cost of living. Property taxes are low, bond issues are limited, and many have their own organic gardens, and some hunt and fish for food and recreation. Many Sequim residents also raise sheep, cows, Llamas, Alpacas, or chickens for food or for an extra source of income. Number 7. Sequim does not have the extraordinarily high temperatures that hit many states every summer. While others suffer 100° to 110° temperatures in sweltering heat, Sequim temperatures may hover in the 70’s and 80’s on a typical summer day. The news of the worst drought 50 years in the midwest foretells higher food prices and other consequences, but Sequim has never had a drought. And how could I forget to add that we also don’t experience the icy cold temperatures of much of the northeast and all the northern states, including Alaska where I grew up. Number 8. Sequim has great golf courses. The Cedars at Dungeness is the driest course in Western Washington, and that includes all the Seattle area courses. Read more about this Sequim Golf Course. For passionate golfers, this alone is reason to say Sequim is the best place to retire. Number 9. Sequim has the Olympic National Park with hiking and camping in untouched old growth forests. See photos at Hurricane Ridge and Lake Crescent. It has been said that Sequim has more recreational activities than any other American city. I can’t say for sure if this is true, but it may be. I can’t think of anything you can’t do here, except downhill skiing on a major ski hill. But you can do that at Mount Baker or Crystal Mountain or several other nearby ski areas. Number 10. Sequim has Bays, the Strait, rivers and lakes, and the Ocean for serious boaters, kayakers, and fishermen. Come and see for yourself. Sequim is the best place to retire. The famous Sequim Irrigation Festival starts today and events are scheduled throughout the weekend. The Sequim Irrigation Festival is 117 years old, which makes this the oldest continuing festival in the entire State of Washington. There are many fun events, including a Sequim Irrigation Festival Pageant, Arts & Crafts Fairs, Merchants’ Street Fair, Sequim Open Air Market, the Sequim High School Operetta, the Logging Show, a Fireworks Show, a Kids’ Parade, a Sequim Irrigation Festival Grand Parade, a Car Show, a Carnival, and the Jesse Marunde Memorial Strongman Contest. I have many photos of Jesse Marunde flipping cars, pressing logs, carrying a Harley Davidson, and squatting massive weights, but this photo is one of my favorite photos of Jesse. He was doing what he did best–encouraging young boys and girls to be their best and sharing his passion for life. 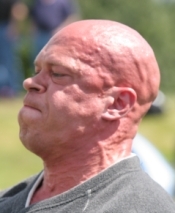 In this photo you can see the joy in his face as he greeted kids at his last Sequim Strongman event. The Strongman contest is in Jesse’s memory. Jesse became Internationally popular as a young Strongman because of the new techniques he brought to the sport of Strongman, including his unique application of some Olympic lifting techniques, especially to the overhead log press. He also was very charismatic and was the first professional strongman in the world to play to the audience. Fans absolutely loved him. He once spent two hours in Europe giving people his autograph after an event. Jesse’s goal was to become the strongest man in the world, and he almost did. He came in second in the World’s Strongest Man Competition in Chengdu, China before he died here in Sequim of a sudden heart attack while working out in his gym. Jesse was my son, and may I say as a father, I was damn proud of him. But my pride was not just because he was a great athlete (6’5″ and 320 lbs of muscle), it was because he was a man of good character, a disciplined hard worker, and because of his love and generosity to everyone. He was my son, but he was also my best friend. As you can imagine, having grown up in Sequim and becoming world famous, he was the pride and joy of Sequim. This weekend the Sequim Irrigation Festival celebrates Jesse’s memory with strongmen coming from all over the country, including Karl Gillingham of Minnesota, Kevin Nee of Boston, Brad Dunn of Orlando, Corey St. Clair of Columbus, Grant Higa of Maple Valley, Zack McKarley of Ellensburg, and Nate Bollin of Sequim. The strongmen events will include the Keg Toss over a 15ft bar, the Giant Dumbbell Press Medley, the Axel Press Last Man Standing, and a 330# Stone Over Bar for Reps. This is great entertainment for everyone and a good photo opportunity. You can check out the schedule of events from the Festival website at Sequim Irrigation Festival. 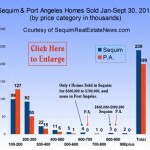 What is the real estate market and the U.S. economy going to do in 2012? Here is my read on the real estate market and the the economy for 2012. In terms of credibility in writing an article on the economics of both the real estate market and the U.S. Economy, just for your information, I have a degree in economics (with an emphasis on monetary policy), a degree in teaching, a doctorate in law, and 37 years as a business owner, lawyer, registered financial adviser, certified estate planner, business consultant, and real estate broker. While that certainly doesn’t guarantee anything about the accuracy of my perspective, the so-called experts and talking heads on T.V. have been wrong far more than they’ve been right since 2005. The odds are my prediction will be more accurate than the talking heads who never warned us of the impending doom until after the fact. There are economic cycles and patterns that tend to repeat themselves over time, but these past five years have seen variables thrown into the mix that no economic model has ever had to include in the predictive programming. No Ph.D. has ever lived through such times with so many variables and so many potentially complex outcomes. The John Keynes economists have blown a fuse trying to figure out how to run fiscal spending and taxation models and not run the country over the cliff. The Milton Friedman economists believe monetary policy is running amok and has been hijacked by social terrorists. Does the business I want to start have a high probability of success or a low probability of success? Some businesses do, in fact, have very high statistical probabilities of failure. New restaurants fall in this category, as well as antique shops, used bookstores, specialty stores, clothing stores, small toy stores, art and photography shops, some personal service businesses (accounting, bookkeeping, tax preparation), and there are others. Does the business have high overhead or high fixed and variable costs? Entrepreneurs are infamous for over estimating sales and income. In Sequim and in Port Angeles, I have watched for 18 years as businesses come and go for this reason. Will the business be very labor intensive? A B&B (bed and breakfast) is very labor intensive. It may sound fun, and I’m sure it can be, but a recent B&B owner told me if she had any idea it would have been so consuming, she would never had done it. Will the business be consistent with your personal interests and passions, or are you considering it just because friends or family have told you, “You should get your real estate license. You would be so good.” This is just an example, but many retirees have gotten their real estate licenses only to wish they had never bothered. What will you actually do in your business everyday? Many small businesses sound good at first, but later the owner realizes that what they thought they would be doing is not at all what they had to do everyday in the business. Would you start a business because you need to make money, or because you want to accomplish something else? The answer to that question will have a huge impact on how you develop your business model? These are just some of the questions worth asking if you are thinking about moving to Sequim and planning to start a business in your retirement years. Your retirement should be some of the best years of your life, and the last thing you and your spouse need in retirement is a financial and stressful nightmare. Right? I share this because I worked with hundreds of business owners as a lawyer over two decades, and I learned more from the mistakes and failures of business owners than I did from those who succeeded. If you buy a home and make me your Sequim Buyer’s Agent, I would consider it a privilege to share anything I’ve learned about businesses, legal entities, separation of liabilities, asset protection, estate planning, business succession, and marketing on the Internet. It might also be helpful to know what businesses have succeeded and failed in Sequim and what locations tend to be good and bad for business, if you’re going to have a bricks-and-mortar. I’d be glad to share what I’ve observed. By the way, some retirees are working out of their homes and using the Internet to sell their products or services. It’s a brave new world, and there are many unique business opportunities today that we didn’t have 10 or 20 years ago. As a hobby, I’ve started a home business apart from my full time real estate brokerage, which involves health and nutrition products (consistent with my own desire to lose weight and get healthier). I’ve always wanted to build a passive or residual income, and this business will do that too. I did my due diligence to find a company with outstanding products and with integrity from the top to the bottom. You can learn more about this company and their products at Sequim Home Business. Whatever business you might be looking at, you can always email or call me and ask questions as you do your due diligence. 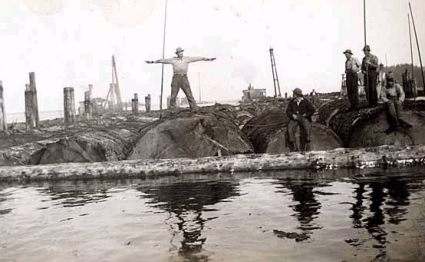 Logging on the Olympic Peninsula has been an important part of the economic activity, just as fishing was once a major force. 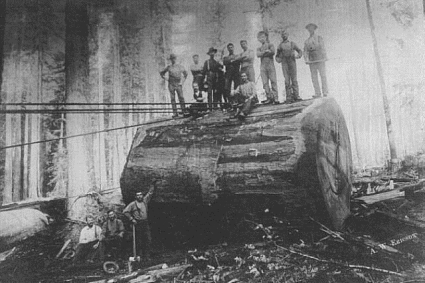 Logging has a fascinating history revealed in these old photographs. 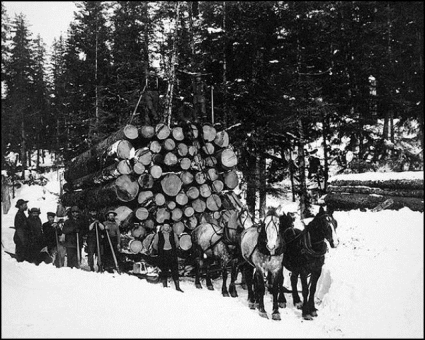 It’s hard to imagine handling such massive trees and logs with such primitive equipment, but they did it. The size of these huge trees boggles the mind, since we so so few large trees today, even among our old growth forests in the Olympic National Park. Logging on the Olympic Peninsula with axes and hand saws and sleds just seems overwhelmingly difficult. We have some great museums in the area with more photos and stories about logging in the old days. I spent time yesterday with an 84-year old homeowner (Bill), and we had a delightful conversation. Bill and his wife of a lifetime, Delores, purchased their home in 1962 for $45,000, and even at that time it was a great price. We sat and talked in the living room of their gorgeous home. Today this home is probably worth over a half million dollars. The water view alone is stunning. The home sits on over an acre and is beautifully landscaped, but Bill confessed to me that his gardening and landscaping activities have slowed down a little at his age. At 57 sometimes I think I’m over the hill and getting old(er), but Bill assured me that I am still a kid. I like Bill. I often joke with my clients by saying that, “all my clients are smarter than me,” but there’s no doubt that most of my clients are more experienced and wiser than me, and I love learning about their lives and experiences. I thought you might enjoy hearing what an 84-year old gentleman thinks about many of the issues of today. Consider this. Bill grew up before residential mortgages were invented, before checking accounts, before credit cards, before televisions, while the U.S. Dollar was still based on the gold standard, and before Fidel Castro got into politics. Bill has seen history. We talked about politics. Bill said it is shocking how the English language has been hijacked by politicians. Words used to mean something, and there was a time when lies were simply unacceptable. Today, Bill argues, politicians say anything and constantly promote larger and larger government. He talked about basic financial rules he learned growing up. Bill was two years old when the market crashed in 1929, and while he doesn’t remember those early years, he certainly grew up in a generation where personal financial responsibility was paramount, and you only spent money you actually had. Bill pointed out that we now have a Federal government that does not live by the rules of math or fundamental financial accounting principles. Bill still believes that one plus one is two and that everyone, including the government, should live by the rules. His common sense is refreshing. I asked him if he would run for President. We talked about real estate. Bill was the youngest Seattle hotel manager in 1955 at 28 years old. As he says with a smile on his face, “Seattle has changed a lot since 1955.” Bill has had an illustrious career as a real estate broker, and has personally known some of the big names in real estate. He has an ability to see a longer history of real estate cycles than the rest of us, and he has been an analytical student of real estate brokerage all this time. He sees the traditional brokerage as dying. He said the overhead is just killing them. And at 84, it was a delight to hear Bill talk so enthusiastically about the power of the Internet in the real estate business. He predicted that the future of real estate will be based on the Internet. Bill was full of wisdom and gentle conversation as he reminisced about his years in business and in real estate. Bill’s wife, Delores, recently “went home” as he says, and Bill openly shared that these past few months have been months of grieving, but he smiles as he talks about his future and life. He believes he still has more to do, and he embraces the challenges as he makes plans for this next phase in his life. I admire Bill. What a privilege it was for me to spend the day with him. Today I take a detour of sorts on this real estate blog. Normally you will find a daily post about some aspect of buying real estate, some negotiating tactic or an inspection issue, or a market analysis of prices or days on market. But today I’ll talk about life, hence the title, “Life Happens.” There will be no search engine optimization of this post, nor any glitzy photographs. Just a true story. I sold a home to an incredible couple from Georgia, and with tremendous excitement they moved their four boys and five truck loads all the way to Sequim. They just got moved into their new home about two weeks ago. I really have grown to love this couple as dear friends, and I identify with their family, because like me, they have four kids. I had three boys and one girl. They have four boys, ages 11, 15, 17, and 20. Last weekend their 15 year old boy died after a seizure. We all suffer loss during this life. We just don’t know when it will happen. I attended a memorial service last night for Dakota, and it was very hard to maintain. Perhaps it was too close for me. I lost my son four years ago, and I know how hard it was and continues to be for everyone in the family. I saw how hard it was for my two other sons and my daughter (who is 15 now and also a friend of Dakota). There are still hard days when one of us needs to pick up the phone and just talk. We loved Jesse so much, losing him seemed almost unbearable. And so it is for Dakota’s family now. I am deeply grateful that Sequim has already surrounded this family with outpourings of love and support. The Sequim High School kids filled a large banner 15 feet long with personal handwritten notes of love. The family’s neighborhood has rallied to provide food and support night and day. Local Churches have asked if they can help. I am also grateful that Dakota’s parents, Larry and April, have each other, and that the boys, Zack, Austin, and Quinn are such fine young men devoted to each other and that they have their faith to lean on. Life is unpredictable, and that’s why I titled this article, “Life Happens.” Life doesn’t always happen according to our plans. In fact, it almost certainly will take some detours along the way. In this case, the loss of a beautiful young man who was handsome and athletic, who had the kind of moral standards and good character we could only wish for all our children, is almost overwhelming. It just breaks the heart. One thing for sure. There are many who love this family, and we will rally around them and lift them up every day for as long as it takes. Sequim WA News is full of interesting, exciting, and politically intriguing events and local news. I don’t normally include news directly from the local newspapers, but I thought you would like to be aware of the two local newspapers, and both have online versions of the news. Here is a sample of some recent headlines, and you can click on these headlines and go directly to their online newspapers. This is another great way to keep up with Sequim WA news. If you’re looking for a safe road to go on a bike ride in Kitsap County, David Brumsickle, owner of Silverdale Cyclery, will tell you to go to Sequim, in Jefferson County. about a new city hall. The arrival of a new strain of biotoxin in Northwest waters last month comes with more questions than answers and is likely to complicate the lives of shellfish gatherers and health officials. SEQUIM – City Council members received both exactly what they expected and several surprises this week when they heard a report on a study commissioned by the council to learn how Sequim residents see their city. City of Sequim residents are generally satisfied with how operations are going, according to results from a customer satisfaction survey. SEQUIM – Jim McEntire and Linda Barnfather were grilled on such topics as unions, the Carlsborg urban growth area and economic development at the first face-to-face political forum for the two Clallam County commissioner candidates. 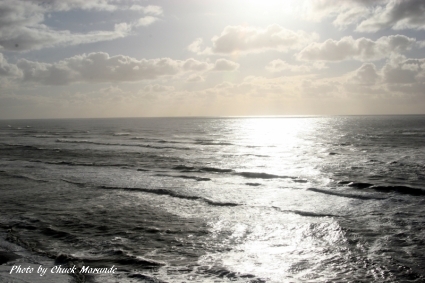 By Reader Submitted Wayne “Bud” Curtis, 76, passed away peacefully on August 20th, 2011 from lung cancer. Bud was born in Alliance, Nebraska on October 20, 1934 to Della and Clarence Curtis. I hope you enjoyed this preview of Sequim WA news. 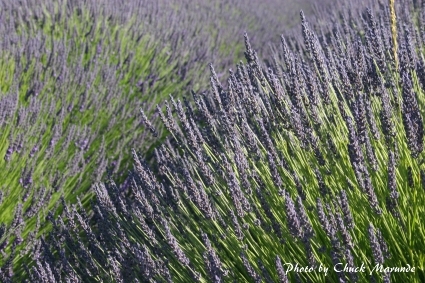 The Sequim Lavender Festival is coming July 15th through July 17th, 2011. This year we will have two Lavender Festivals. There is the Sequim Lavender Grower’s Association, which sponsors the Sequim Lavender Festival, and there is a new association called The Sequim Lavender Farmer’s Association, which sponsors the Sequim Lavender Farmer’s Faire. Sequim is the Lavender Capital of North America, and the festival brings thousands from outside the area, including people who fly in from all over the country. Lavender is a serious business, and Lavender is a fun business, too. The Sequim Lavender Festival will include Lavender Central, a downtown Sequim street fair and food court. They also have a free self-guided tour of seven lavender farms. The Sequim Lavender Farm Faire will have a bus tour of six more lavender farms. They will also have an event called “Lavender in the Park,” a street fair at Carrie Blake Park. Here is a video from last year’s Festival downtown food court. The Sequim Lavender Farmer’s Faire is sponsored by Cedarbrook Lavender & Herb Farm, Olympic Lavender Farm, Port Williams Lavender, Purple Haze Lavender, Sunshine Herb & Lavender Farm and Washington Lavender. The Sequim Lavender Festival is sponsored by Blackberry Forest, Martha Lane Lavender, Oliver’s Lavender Farm, Nelson’s Duck Pond & Lavender Farm, Lost Mountain Lavender, Peninsula Nurseries and The Lavender Connection. We’re expecting beautiful sunny weather in the Sequim Rain Shadow, so come and see our Sequim Lavender. Have you ever been insulted by someone who apparently insults people all the time, but doesn’t even know it? I had a law school study partner who was brilliant, but without even trying he would insult people almost every day. I sold a house to a very sharp client who told me an interesting story. He sat down with a real estate agent and was chatting when she ask him, “Are you working with any other agents?” He responded with a yes as he was still in the process of interviewing a couple of agents, at which point she turned to him and said, “Well, if you’re working with other agents, I won’t have anything to do with you.” He was really surprised, and then he hired me. Some people have an uncanny ability to insult others without even trying. But when a professional salesperson insults clients, it really rises to a new level. I love the cliche, “Truth is stranger than fiction,” because so often it is. I write a lot about how technology and the Internet have revolutionized the real estate business for buyers and sellers, but there’s another very important part of the real estate business–how clients relate to their agents and how agents treat their clients. We all want to be treated with respect, and that is certainly true when you hire someone to help you find your next home, or when you list your home for sale. Life is too short to hire someone who specializes in insulting you, even if it is unintentional. Sequim is the Lavender Capital of North America. The celebrations are in July of each year, but here’s a clip from last year’s events, and you’ll want to plan to be here if possible. Dr. Lavender shares his expertise on growing and loving Lavender in this video. It’s always an exciting weekend of activities for Lavender lovers and everyone who loves outdoor markets, crafts, specialty items, great food and great music. Thousands of people travel to Sequim from around the country literally. One of the highlights of the weekend is a tour you can take of area Lavender farms, and there are quite a few in the Sequim Dungeness Valley. It’s a big event for Sequim. Chuck Marunde, Broker of Sequim & Port Angeles Real Estate, is pleased to announce a very exciting development that will substantially increase his already large Internet presence. Sequim & Port Angeles Real Estate is now a Branch Office of eXp Realty, the World’s First Fully Immersive Web 3.0 Real Estate Brokerage. eXp Realty is a National Real Estate Brokerage with an innovative business environment for collaborating, supporting agents with their listings and transactions, and an ecosystem for social interaction in and outside of the organization. eXp Realty launched in the fall of 2009, following a name change from BuyerTours Realty (Est. 2007), as a leader in real estate technology and agent compensation, melting away the traditional brick and mortar business model and moving towards a true virtual community, that keeps agent in contact with top agents, the best ideas and technology from around the world. Our Mission at eXp Realty is to lead the Web 3.0 Real Estate Revolution and the Resulting Industry Paradigm Shift. eXp Culture is: Virtual, Viral, Transparent, Green, Collaborative, Supportive, Professional, Dynamic, & Paradigm Shifting – with an Emphasis on Relationship Building and Personal Service! We Provide: Multiple Income Streams, Collaborative and Persistent Education, A Paperless Cutting Edge Technology Platform, and Committee Style Leadership. Contributing to the success of eXp Realty is an aggressive and favorable growth incentive for all affiliates, a large network of high-trafficked real estate websites in major metros across the country and a streamlined education and mentoring platform to ensure agents success within the system. For clients all this means they will continue to get the best Internet information, news, and tools on Chuck’s websites and blogs, along with his continued commitment to a consumer-centric focus placing clients at the center of the Universe in terms of honesty and customer service, but the new affiliation with eXp Realty increases the Internet tools available to clients, increases the back office digital support, increases the knowledge and technical expertise working for clients, and ultimately increases the broad marketing of listings on the Internet as well as more platforms to connect with buyers across the country. The winners in all of this are buyers and sellers as well as Chuck as a broker and agents who work with Chuck, who will earn not only 80% of their commissions, but also earn the right to residual income from an extraordinary company payout plan. The day after Christmas this home on South Laurel Street in Port Angeles was destroyed by fire. It’s still standing, but the interior is completely gutted. It took firefighters 10 hours to extinguish the fire. The owner is Joan Schott, a longtime Port Angeles resident. Joan and her son, who lives with her, suffered from minor smoke inhalation and were fortunate to get out in the early morning hours when they heard the smoke alarm. The cause of the fire is still unknown, although firefighters report it appears to have started in the basement on the opposite side of the house from the furnace. 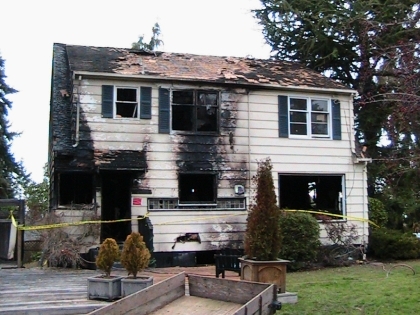 This is an older home, and older homes were not built with the same kind of fire safety codes and materials that are used in new homes today. Fire safety is not a minor issue as this owner would testify.